The Gifford was one of the earliest ships that our grandfather John Davies Williams sailed on between 1898 and 1899. He was about 18 during this time. He told his son, Peris Williams, that it was his happiest ship. The Gifford was a barque built at Greenock, Scotland, in 1892. She was of 2113 net tonnage and constructed of steel, and was rated 100 A1 at Lloyd's. The Gifford was 281 feet 6 Inches in length, 42 feet beam, and 24 feet 6 inches deep. She was owned by Andrew Weir of Glasgow, Scotland, and was valued at about $90,000. The value of her cargo of coal is estimated at about $18,000. The crew of the Gifford numbered twenty-seven men all told. In addition to her captain and three mates she carried sixteen hands forward, four petty officers and three apprentices. She left Cardiff, Wales, in 1902 with a cargo of coal for Montevideo, South America. Thence she proceeded to Rio Blanco, South America, in ballast, and from that point carried a cargo of wheat to Sydney, Australia. She was then ordered to Newcastle, N. S. W., and left that port on July 12 last for San Francisco with 3500 tons of coal consigned to J. J. Moore & Co. Unfortunately she was caught in thick fog and ran aground on 28th September 1903, and remained stranded close to Mussel Rock near the Golden Gate Bridge until storms and currents demolished her. Fortunately, all her crew were rescued but she was a total loss. During slack tides, divers have salvaged pieces of coal, portholes, and rigging from the Gifford's scattered remains. Great granduncle Captain Richard Williams was appointed Master of the new schooner Martha & Harriet (139 tons) at Aberdovey 9/2/1874 when he was still aged '32'. Sadly, the Martha and Harriet was lost 28/10/1882. Richard Williams was then 41. He and the crew were formally discharged at Halifax, Nova Scotia. Richard Williams was back in Aberdovey by 8/1/1883. He was not merely Master of the Martha and Harriet for he owned 20 shares in the new vessel. However, he had mortgaged his 20 shares to David Jones of Machynlleth, Slate Agent, 6/2/1874 to secure the 'sum on account current' plus interest at 5% per annum. What happened to Richard Williams after his return to Aberdovey in 1883 is not known but he died just three years later. First cousin twice removed John William Evans (1858- ) Mariner, from Aberdovey was serving on the Martha and Harriet in 1875-76 (139 tons), aged 17, as Cook and Seaman at £2 15s. a month. He was paid off at Liverpool 17/1/1876 when the balance of his wages was 10s. He signed again at Liverpool 29/1/1876, but for some reason he did not join the Martha and Harriet before she sailed for Oporto. 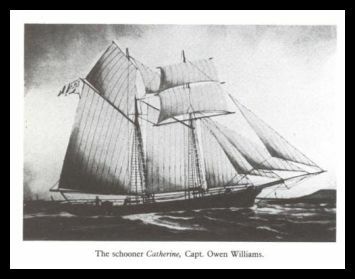 Our great grandfather, Captain Owen Williams, was a share owner and the first Captain of the 76 ton schooner, Catherine. She was built at Llyn Bwtri, near Pennal, on the river Dyfi and registered at Aberystwyth No. 2 in 1869. One of Taid's earliest trips was in the barque Charlotte Young but we have no information as to dates nor destination. 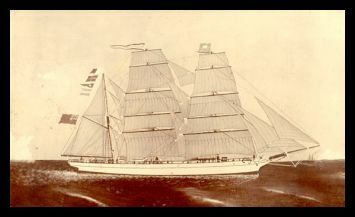 On May 9th, 1910, the Charlotte Young, built in 1867 by Denton, Gray & Co. and owned at the time of her loss by Job Bros. was on voyage from St. John's, Newfoundland to Pernambuco with fish when she was wrecked 30 miles north of Pernambuco. 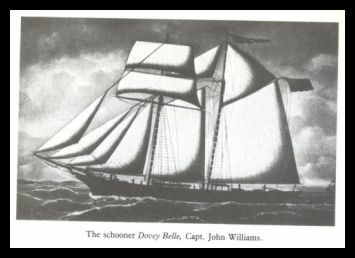 First cousin twice removed, John Williams was captain of 'Dovey Belle' built in 1867. The schooner was reportedly lost near Grassholme off Pembrokeshire on July 17th 1909. This photograph is probably of the boat James Carden Collins had built. 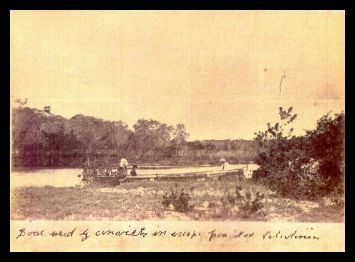 The caption says it is the 'boat used by convicts to escape from gaol at Caledonia'. James Carden Collins married twice, his second wife, Jane Susannah Cox Pugh, who was my grandaunt's husband's niece's husband's mother! The schooner Jane Owens was built in 1858. Great granduncle Captain Richard Williams served as Master of the schooner from 1866 until he was discharged at Garston (Liverpool) 15/9/1873. He was then about 32. Great granduncle Ellis Williams was Mate of the Jane Owens in 1866, age 22, though he did re-join the vessel as Boatswain (£4 a month) later in that year and was discharged at London 18/8/1866. William Morris joined the schooner Jane Owens as Mate (£4 5s.) early in 1878, aged '46', and was discharged at Connah's Quay 21/3/78. Great granduncle Captain John William Williams, and his son (first cousin once removed) Captain John Williams, were both aboard the vessel Jane Owens in Penzance Cornwall in 1881. John senior was the Master and John junior was an Ordinary Seaman. The rest of the crew were the Mate, David Evans, A B Seaman, Richard Morgan, and the Boy, John Thomas. The entire crew hailed from Aberdovey. According to Lewis Lloyd in "A Real Little Seaport"; Granduncle Captain David John Williams was aged 15 in 1887 when he joined the schooner Jane Owens as O.S. (£1 5s a month), having served previously aboard the 'Lerry' 2/11/1887. He continued as O.S. (£2 a month) aboard the Jane Owens until he was discharged at Aberdovey 18/5/1888. Sadly, the Jane Owens was lost off the Smalls 31/12/88 and the crew were formally discharged at Holyhead 2/1/1889. 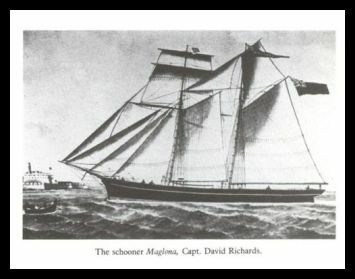 The schooner Maglona was mastered by both our great grandfather, Captain Owen Williams, and Captain David Richards, the son of Captain William Richards. According to Lewis Lloyd in "A Real Little Seaport"; By May 1876, aged 32, great granduncle Ellis Williams was Mate (£4 10s. a month) of the schooner Maglona. He joined the Maglona at Porthmadog 8/5/1876 and was discharged at Middlesborough 26/6/1876, having served previously aboard the Liffey Maid. First cousin twice removed John Evans served as an Ordinary Seaman on the schooner Maglona in 1876. 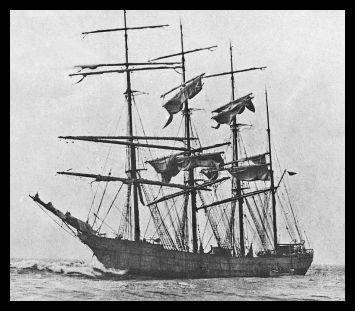 The Maglona was lost at Cape Race, Newfoundland in 1887 whilst seeking a cargo of salt cod. All the crew were saved. The Queen of Cambria, Caernarfon, (not to be confused with the Cambrian Queen) (O.N. 74867) was a three masted iron barque (865 tons) built in 1876 by Osbourne Graham and Company, Hylton, Sunderland. 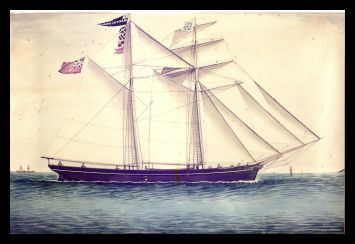 She was 194.2' long by 32.8' broad by 20.2' deep and owned by Robert Jones, Plas Tirion, Pwllheli in 1876 and then William Thomas and Son, Nefyn. She was bought by Robert Thomas of Criccieth and Liverpool in 1896. The Queen of Cambria arrived in Dunedin, Australia on 10 Feb 1883 and is reported to have arrived in Port Chalmers, New Zealand on the same day after sailing from Deal on a 90 day voyage. The ship's Master at that time was a Captain M. Parry. 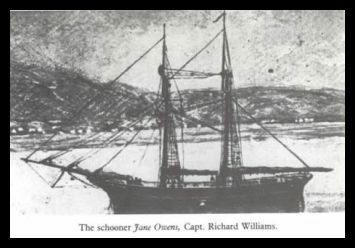 William Morris joined the schooner Jane Owens as Mate (£4 5s.) early in 1878, aged 46, and was discharged at Connah's Quay 21/3/78. 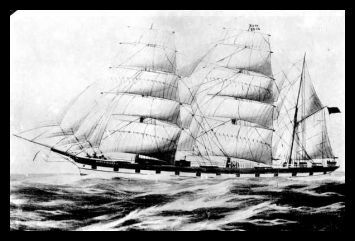 He then served on the Seven Brothers before joining the schooner Sarah Davies as Mate (£3 15s. a month), aged 47. He was discharged at Aberdyfi 17/12/1878. Great granduncle Ellis Williams aged 34 in 1880, appears to have served as A.B. (£3 a month) aboard the schooner Sarah Davies. First cousin twice removed Captain John Williams was appointed Master of the schooner Sarah Davies (90 tons). His home ashore was then No.35 Copper Hill Street, though in 1891 (Census), aged 26 and single, he was under his parents' roof at No. 43 Copper Hill Street (a Master Mariner). Subject to a short break in 1899, John Williams remained in command of the Sarah Davies until 1900 (the vessel was transferred to Dublin 30/12/1904). About 1888, granduncle Captain David John Williams joined the schooner Sarah Davies as O.S. (£2 5s a month). Taid is mentioned in the book 'A Real Little Seaport' by Lewis Lloyd (ISBN 1 874786 48 8) as serving as 'Boy' at a rate of £1 a month aboard the schooner Sarah Davies. Some of the information given by Lewis Lloyd is not quite correct as he states that Taid joined the Sarah Davies at the age of 15 when in reality, according to his Discharge Book, he was a mere 13. This was in 1894. First cousin twice removed Richard Williams was serving as Ordinary Seaman (£1 5s. 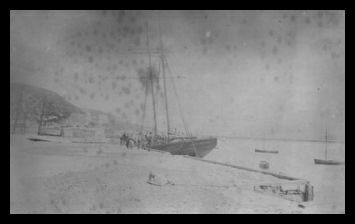 a month) aboard the schooner Sarah Davies in 1897-8 and was discharged at Porthmadog 25/04/1898. The Viceroy of India was built in 1929 by A. Stephen & Sons Ltd., Linthouse, Glasgow and owned by P. & O. Steam Navigation Co. Ltd., London. My niece's husband's grandfather David Hamer Meredith sailed to Egypt on this vessel which was sunk a few weeks later by a U-boat! 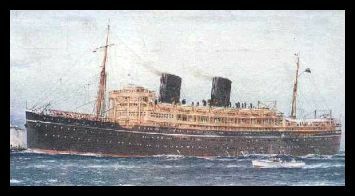 The vessel was ordered as steam passenger ship Taj Mahal, completed in March 1929 as Viceroy of India. On 12 Nov 1940, it was requistioned as troop transport by the Ministry of War Transport (MoWT). At 05.24 hours on 11 Nov 1942 the Viceroy of India (Master Sydney Herbert French) was hit by two of four torpedoes from U-407 34 miles northwest of Oran and was missed by the stern torpedo at 05.31 hours. The ship had arrived at Algiers with convoy KMF-1A, disembarked her troops for Operation Torch and was returning empty to Gibraltar when torpedoed. She was taken in tow by HMS Boadicea (H 65) (LtCdr F.C. Brodrick, RN), but sank in 36°24N/00°35W. Four crew members were killed. The master, 398 crew members, 29 gunners and 22 passengers were picked up by the destroyer and landed at Gibraltar.